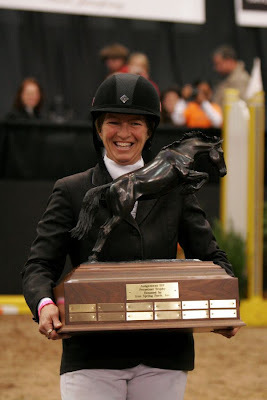 Cazenovia, NY - November 7, 2010 - Beezie Madden piloted her horses Mademoiselle and Coral Reef Via Volo to the win in the $80,0000 Syracuse Sporthorse Cup presented by Copernicus Stables. She seems to own this Cup as she was victorious in 2006 and 2008 as well. The final Sunday event of the Syracuse Invitational Tournament in downtown Syracuse is always an audience favorite and today was no exception. This special three phase challenge was designed specifically for the spectator, with a format that is unique to the Syracuse Sporthorse Cup. Twenty riders from the International division who accumulated the most points throughout the week were invited back to compete in Phase One of today's three part competition. 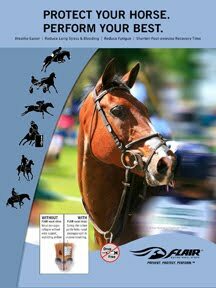 Each could choose different mounts for the various phases of this event to capitalize on the strengths of the horse. Phase One was the $30,000 "Hit and Hurry" where riders accumulated points by keeping all rails up or had deductions for fallen rails. At the end of Phase One it was Beezie Madden, Hillary Dobbs, Margie Engle, Kate Levy, Harrie Smolders, Kent Farrington and Darragh Kenny - all who secured a position as a coveted "top seven" and moved into the final two phases of competition. In the second phase, the popular Four Bar Competition, Beezie rode Mademoiselle through four clear rounds and jumped the top height of 6'3" keeping her in a tie position going into the final round. The final round was the speed phase where the fastest clear round earns the most points. Beezie was quite happy with her mare, Mademoiselle, since this was "unchartered waters" as Beezie had never ridden her in the four bar competition before. Harrie Smolders and Exquis Power Fee, Hillary Dobbs riding her longtime mount, Quincy B, and Madden and Mademoiselle all managed to go clear in all four rounds of the four bar competition. Each of the seven top riders returned for the third phase, which was a modified grand prix where speed and accuracy counted Beezie and Hillary were tied with the rest of the group close behind. The pressure began to get the best of some of the riders and several lost points for falling rails. Last to go was local favorite, Beezie Madden and her petite but mighty mare, Coral Reef Via Volo. The pair kept their cool and laid down a perfect clear round to claim the Syracuse Sporthorse Cup once again. Following the class, Madden noted that it is great to have the fans cheering her on to a win at her own show. "It is great to have the young riders look up to me and anything that can encourage the sport, not only in the local area but all over, is a great thing. The fans are always behind me so this is definitely a nice way to leave the show," the rider stated. "I like this class because it shows consistency and depth in your string and I am happy to say that I have some nice depth in my string," Madden continued, "I have been using Zhivago all week in the speed classes, but he is only seven years old and I thought he had done enough. As far as taking a shot to win I wasn't going to do that with a seven-year-old so I picked Mademoiselle. I really haven't done that many speed classes with her so I was happy to see that she can be so fast. Then again in the four-bar I had no idea how she would be, but I know that she is a trier and she is brave and has a lot of heart so she really came through there. Via Volo is just fantastic, so I can't say much more about her; I love that horse!" 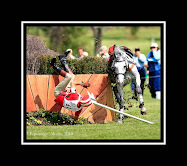 Today's competition concluded the 2010 Syracuse Sporthorse Tournament featuring the 127th National Horse Show. For more information, please visit www.syracuseinvitational.com.